I was feeling a bit blah today but it was beautiful out (81, woo hoo! ), so I tell my hubby I'm going over to Forest Lawn Memorial-Park to look for third-ish cousins I recently discovered are buried there and to enjoy the nice day. Hubby laughs and replies, "You know, not everyone thinks of a cemetery as a great place to cheer up!" My reply: "Genealogists do!" Liberty section, looking more or less NW (top) and S (bottom). The silly newbie part? Well, I've lived in Southern California for 21 years, but have rarely visited a cemetery (I have few relatives buried here). Most of my cemetery research has been done in smallish, easily navigable church cemeteries in Louisiana. I visited Forest Lawn as a tourist on a family trip once when I was young, so I knew it was big, but WOW, I had forgotten exactly how big! Ankle brace, anyone? My car's on the far left, if you want to compare the hill's steep grade to the level road. My cousins are buried on a very steep hill. Thanks, guys! I'm not frail or anything, but I have been known to trip over my own two feet when looking at headstones (or a book, or up at architecture) instead of where I'm walking. Down was harder than up, actually (pine straw can be slippery). So I made a mental note to take my cell phone next time; thoughts of indelicately crawling up the hill with a twisted ankle, using mini American flags à la rock-climbing pickaxes came to mind. Speaking of flags, there were some visible in this section from Veterans' Day. We're everywhere! (Cajuns and/or Acadians, that is.) Couldn't resist taking a photo--I'm always surprised to see an Acadian name in California. I don't directly descend from Babineaus, but my great-grandpa Constant Légère married a Babineau/x (Estelle, his first of four wives) in Louisiana. I'm guessing Albert G. Babineau was Acadian, because most Cajun Babineauxs seem to spell it with an 'x.' Will have to check Ancestry.com to see if I can find out his story. His wife, presumably, Marie A. Babineau, is buried next to him. Some markers I just find touching. Having recently celebrated my first wedding anniversary with my husband, I thought this remembrance of Edwin Henry Grobe was particularly lovely: "Devoted companion through forty years of marriage, he lives in memory ... his love and kindness a constant and continuing inspiration, as they were each day of the many wonderful years we shared." And oh, to be remembered for the ages as your husband's "best girl." So sweet. Will have to add these to Find a Grave, I think. The western-facing slopes get beautiful golden light in the late afternoon. Not a bad place to rest eternally, nor spend an hour on a lovely day, n'est-ce pas? Surname Saturday: Surnames tab up on my blog! Hey folks, if you have Louisiana ancestors, including French, Acadian, Cajun, Quebeçois, German, Irish, English, Scots-Irish or Scottish, in New Orleans, Northwest Louisiana or Southwest Louisiana, just a quick Surname Saturday note to say: Check my new Surnames tab at the top of my blog! Not all my lines are listed, by any means, but some of my more recent branches are, and some that I hope to be blogging about in the future (such as my NOLA colonials and my dash of German ancestry). I have more Surname Saturdays in the works, but meanwhile, I'm trying to clean up and sync my citations and notes from among my private Ancestry tree, my Reunion database, and many computer notes and paper files, so that when I do post Surname Saturdays, I can either do it with footnotes, or have reports ready to go for inquiring cousins. Here's a quick name list. 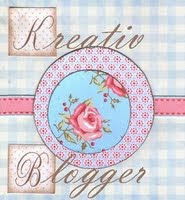 Dates, places and links to blog posts (if any) are included on my blog's Surnames tab. Bogard, Bopff, Boftz, or Bossie?, Burell, Burelle, Burnaman, Burnam, Burnham, Boernemann?, Carriere, Cotter, Davis, Desbordes, Debordes, Farris, Faress, Fariss, Hadden, Hall, Harrell, Hollier, Kilpatrick, Langlois, Lebert, Leger, Legere, McBride, McCoy, Pate, Potier, Poiter, Pothier, Sanmerine, Saumerine, Smith, Stemmann, Stemmans, Stemann, Stephenson, Stevenson, Thommelin, Tommelin, Thomelin, Tomelin, Trahan, Trepagnier, Trepanier, Trepagny, Werich. Your name isn't here? If it's in NW or SW Louisiana, especially if it's in Claiborne, Webster, Bienville or Lafayette Parishes, check my blog labels or tags list on the right-hand column of my blog just in case I've mentioned your people in passing. Or if you think we might have a connection, drop me a line at hallroots **at** sbcglobal **dot** net to compare notes. There is a Grand Chenier Rd. in Cameron Parish, and there is a Leger or Legere family in Cameron Parish in the 1920 census with a daughter Elza ("Elzea" in Southwest Louisiana Records) who was born in 1901 in or near Kaplan to Alcée Legere (possibly spelled Leger) and Ida Landry Legere. 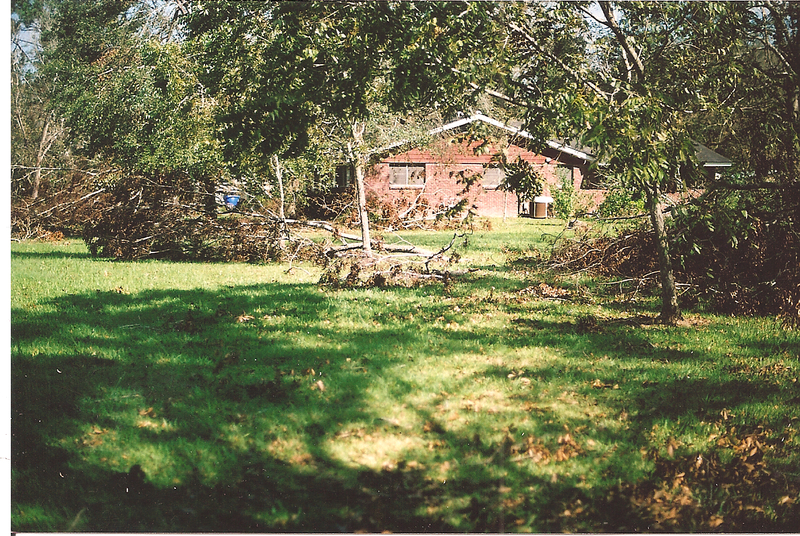 Elza married Alva ("Alvy" or "Cap") Miller and lived in the community of Grand Chenier, in Cameron Parish. She is related to both P.J. and I through the Legere family, but neither of us knew of her before P.J. was given this box of photos. P.J. does remember that his father occasionally visited cousins in the Cameron area, though. The photo mounting with what looks like a cardstock backing resembles one I have from North La. c. 1905. If it's from the same time period, the woman would probably be a generation older than Elza, perhaps her mother Ida Landry Legere or an aunt? Is there an "Alicia" relative perhaps? Or another "Elzea" or "Alcea" relative? Or could it be from c. 1920 and be Elza? Perhaps Ida Landry Legere is related to Oza Landry Blanchard, P.J. 's grandmother. I'm still investigating this angle along with the Legeres in Cameron Parish. Meanwhile, P.J. and I would like to know if anyone out there can help us identify the woman. And while I'm asking, P.J. would also love to find a photo of his great-grandmother, Eve Legere Blanchard, wife of Romain Blanchard, of Kaplan, LA. She was born in 1862 in St. Landry Parish to Hypolite "Paul" & Mary (Addison) Legere and died in Kaplan (Vermilion Parish) in 1920. E-mail me at hallroots **at** sbcglobal **dot** net if you can help with either request. Thanks! To my Resources page (also linked up top), I added a link to some La. historical newspapers online (under my "most frequently-used" Internet resources at the top of the page) and a few links for African-American online research. Hope you find these pages useful. Let me know if you have any suggestions. Thanks! Just a note to point out the links to new pages on the top of my main blog page. I added a "Disclosures" page to make the FCC happy (though I don't have much to disclose, really, despite the word count), and--much more fun--a "Surnames" page with a little info on some of the lines I'm researching (some a little more than others), with asterisks next to surnames with at least one slave owner for whom I have info, and links to related blog posts or lineages I've outlined. Enjoy! I recently came across some notes given to my family by my cousin Zola Scott Hardy, who extracted info from the will of William Hadden, my 4th-great-grandfather, of Jefferson County, Georgia. Here is a transcription, with Zola's notes in parentheses & my notes in brackets. Item #2. ... to my two sons Gordon Hadden and William Hadden tract of land lying on the Ohoopie in Wash. [Washington] Co. cont. [containing] 287 1/2 ac. Household & kitchen furn. equally divided bet. Extracted by: Zola Scott Hardy, a 3rd great granddau. of Wm. Hadden through his dau. Mary Hadden who md. David COTTER . [Mary] later md. in Stewart Co. Ga. Samuel Garrett [23 Feb 1840]. Find no later record of Mary Hadden Cotter Garrett. Three of her children came to Ringgold, Bienville, La. area: son William Hadden Cotter b. 1825 who md. 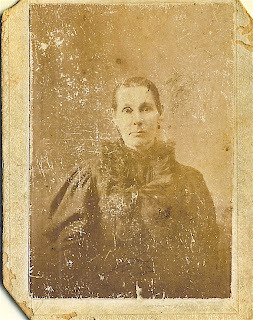 Elizabeth Ann Farress [Faress, Farris] 19 June 1856 Bienville [Parish], La., dau. Sarah Jane Cotter md. John Hide [or Hyde?] Scott 18 Feb 1846 Stewart Co., [GA], dau. Mary David Susan Cotter md. David Jackson Crumpton Stewart Co. Ga.
"A friend of friends" was a password used on the Underground Railroad. My "Friend of Friends" posts on slavery-related records were originally inspired by Sandra Taliaferro's essay here. For more of my posts, click here or see others' posts at A Friend of Friends and on Fridays at Geneabloggers. 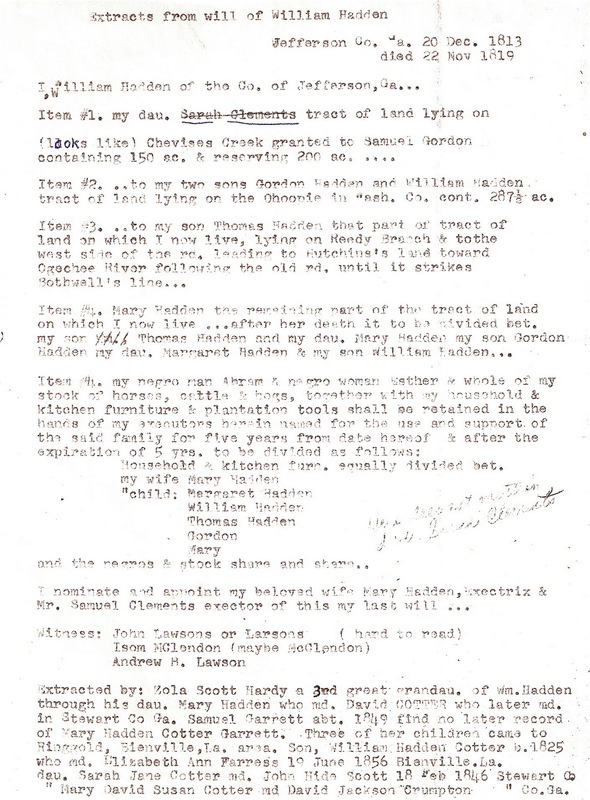 I recently came across some notes given to my family by my late cousin Zola Scott Hardy, who extracted info from the will of William Hadden, my 4th-great-grandfather, of Jefferson County, Georgia. For today I'll transcribe the portion pertaining to those enslaved and will transcribe more later. Click to enlarge the image; partial transcription is below, with my notes in brackets. and the negros & stock share and share ..."
Feel free to contact me at hallroots **at** sbcglobal **dot** net if you are working this line; I don't have a lot of info but am happy to share what I have. 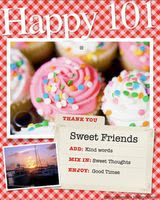 Copyright 2010 by Liz Hall Morgan, all rights reserved. Edward Malapart, 1899-1962, St. Peter Catholic Church Cemetery, Carencro, Lafayette Parish, La., 19 Nov. 2007. Edouard or Edward Malapart was the son of my (half-) great-aunt Marie Idalie Legere and her husband, Jean-Louis "Louis" Malapart, of Lafayette Parish, Louisiana. He was born 25 Aug. 1899 in Lafayette Parish, La. (probably in the Ossun area near Carencro--there's still a Malapart Road there) and died in 1962, though I don't know the exact date. I don't know if he ever married or had a family; he's listed in the census as a farmer. Idalie (Eudalie in some records) died in 1901 when her children Edward and Irma (b. abt 1901) were still quite young. If you're related, drop me a line at the address on my blog. I'd love to know more about Louis & Idalie Malapart and if any photos of them exist. Photos/text copyright 2010 by Liz Hall Morgan, all rights reserved. As a child, the solemn tones people imparted when speaking the names Audrey, Betsy, Camille no doubt formed my sense of the power of hurricanes at a very early age. I don't remember how old I was when I learned that I should go into the hall closet and shut the door if a tornado was approaching, or into the hall at the very least, shutting all (wooden) doors behind me so as to be away from all windows. It just seems like something I always knew, like knowing where to duck at this moment if the earth beneath my feet begins to tremble out here on the West Coast. No doubt the collective community memory, if not the actual experience, of these storms, saved many lives when people evacuated Southwest Louisiana and Southeast Texas before Hurricane Rita in 2005. And if stories of dead cows found 20 miles inland where they were pushed by Hurricane Audrey's 1957 storm surge wasn't enough to send residents packing, the still-fresh news footage of Katrina's aftermath to the east should have converted even nonbelievers. 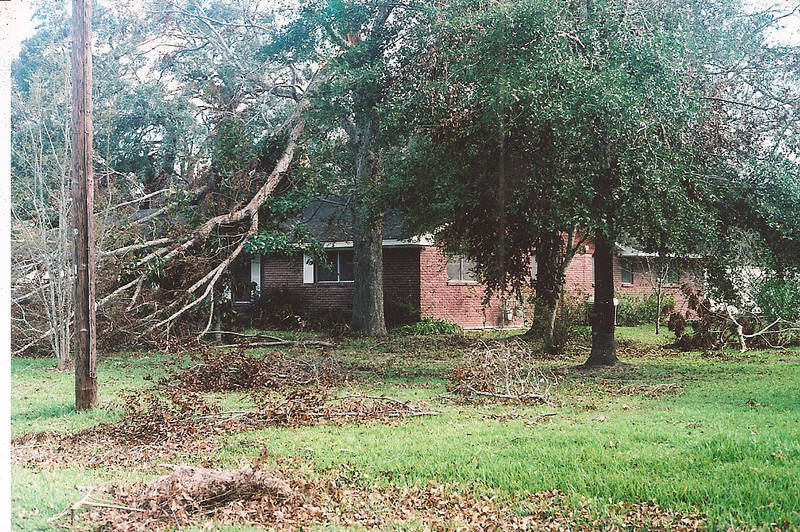 Hurricane Rita hit the Louisiana/Texas border five years ago today. I was in California worrying about my family back home in Southwest Louisiana and Southeast Texas. I don't remember ever actually evacuating ahead of a hurricane in the 25 or so years I lived in Louisiana, only battening down the hatches and stocking up on canned goods and such. But Mom & Dad and other relatives actually got out of town for this storm, even though they live about 40 miles from the Gulf Coast. 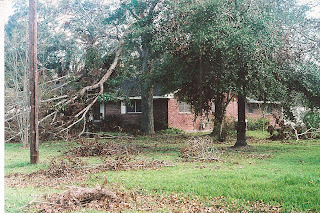 Staying away from home for almost 2 weeks was difficult (Calcasieu Parish, my family's home, was officially "closed" due to the lack of electricity in most areas, passable roads and potable water in some. Cell phones, message boards, and e-mail relayed reports on local damage from those who stayed or sneaked in), though it probably paled to cleaning out the putrid freezers and fridges, everyone's least favorite chore, when they returned. My parents were lucky that only a few trees were downed (and fell away from the house instead of on it) and roof shingles damaged. Many people came home to worse. Some still have repairs left undone, and others cannot afford to return to the coastal areas due to stringent new building codes and expensive insurance premiums. Some call this the "forgotten" hurricane, because news coverage of it was much less than for Katrina. I suspect, however, that Rita and Ike will be the "Audrey" in the minds of my nieces & nephew and their children in the way that Audrey was the cautionary tale for my generation, told by those old enough and lucky enough to have lived through it. 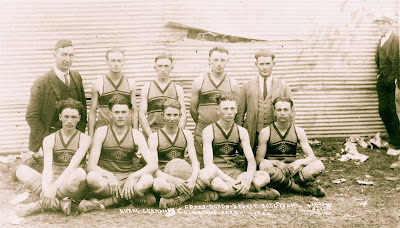 Cross Roads Basketball Team, Rural Champions, by Langdon Photo, Claiborne Parish, LA, 1924. Scan of original photograph owned by the Hall family of La., slightly edited for clarity. Back row, L-R: unknown coach, Isaac "Floyd" McBride, Spurgeon Pate, Ernest Cardwell, unknown coach, unknown man to far right in hat. Front row, L-R: Cullen Lary, unknown player, Joyce Cowser, Theron Harmon, Simpson Harmon. Crossroads or Cross Roads is a community near Athens, in Northwest Louisiana. My grandmother, Edna Maud Pate Stevenson, a teacher, was coach of the girls' team the same year. My mom found a list of names dictated to her by my grandmother many years after the photo above was taken. She had spelled Cullen's name "Leary" but it is "Lary" in the census and Social Security Death Index, and Floyd is "I. Floyd" or "Isaac" in online trees, but another photo of him online confirms that it's him. My McBrides are from South Louisiana, so I doubt Floyd's a relative. Spurgeon, however, is a distant cousin of mine through the Pates. Ernest Cardwell may be a cousin to Georgia Cardwell of the girls' team photo I posted last week, and Joyce Cowser is probably a relative of Sula Cowser on the girls' team. Theron Harmon is the brother of Winnie Harmon of the girls' team, and also Janie Harmon, a "special friend" (as my mom would say) of my grandfather Alvin Stevenson before my grandmother came along. Simpson Harmon may be their cousin; he could be the "Harvey S." Harmon in Claiborne Parish in the 1920 census, but I'm not sure. The other female Harmons are probably cousins as well. If you have young men or teachers who lived in Ward 6 of Claiborne Parish in the 1920 census, you might check the photo to see if your relative is here. Let me know if you can add any names to the photo or clarify the relationships. You can contact me at: hallroots **at** sbcglobal **dot** net. Surname Saturday: COTTER, Ga. to La. 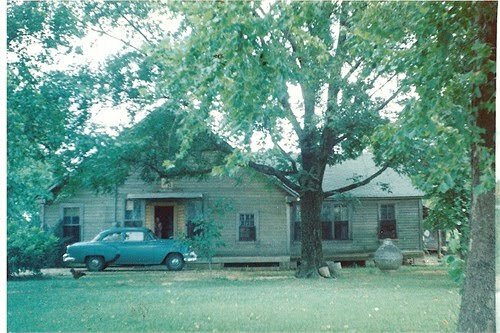 Cotter/Pate/Young home, Bienville Parish, La., c. 1959. Photo by M. Hall, privately held by the Hall family, La. Built in the mid-1800s, with an addition built c. 1904, it was the home to three generations of Cotter descendants. The house was located on Hwy. 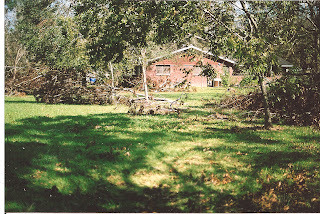 7, about 3-4 miles south of Ringgold, La., but sadly, no longer exists. Today we have my COTTER line from my maternal great-grandmother. Corrections, additions, and questions welcomed; this is a work in progress. Numbers refer to ahnentafel (pedigree chart) numbering. Sources available; see my blog for contact info. 14. Newton King Brady or Bradie PATE. Born on 30 Dec 1852 in Sparta, Bienville, LA (to Anthony William Pate and Emily Lena Smith). Newton King Bradie ("Newt") died in Ringgold, Bienville, LA, on 15 Mar 1932. Buried in Ringgold, Bienville, LA (Pleasant Grove Cemetery). Etta was his third wife (previous marriages were to Mary Elizabeth Jones and Mary E. McGraw). Children: Lucy Elizabeth Pate Corley, Minnie Lee Pate Wimberly, Emily Lena Pate Scott, James Weaver Pate, Zella Estella Pate Young Giddens, Edna Maud Pate Stevenson, Ora Adell Pate Woodard, Jasper Brady Pate. 31. Elizabeth Ann FARISS (or FARESS, FARRIS, etc. ), a.k.a. "Queen Ann Elizabeth Fariss" (on her probate record). Born 5 Mar 1837 (to David Farris and Lucy Davis), "Lizzie" was from Catahoula Parish, LA (possibly her birthplace) and died 22 Feb 1870, in Ringgold, Bienville, LA. Buried in Ringgold, Bienville, LA (Providence Cemetery). Children: William Gordon Cotter, Etta Orisca Cotter Pate, David Augusta Cotter, Lucy Elizabeth Salenah Cotter Tullis. 61. Mary HADDEN. Born about 1792 in Louisville, Jefferson, GA (to William Hadden and Mary Gordon). Mary died after 23 Feb. 1840, possibly in Stewart County, GA (date/place of her 2nd marriage). Children: Isaac Cotter, Sarah Jane Cotter Scott, William Hadden Cotter, James Augustus Cotter, Mary David Susan Cotter Crumpton. "Friend of Friends" Friday: LEGER and other "LE" surnames, SW La. "A friend of friends" was a password used on the Underground Railroad. My "Friend of Friends" series was inspired by the essay posted by Sandra Taliaferro here. I am posting slavery-related records occasionally as I come across them, in the hope that it might help other researchers find their ancestors. For more in the series, click here. Volume 33 of the series is a supplement containing records from 1756-1904 not included in previous volumes, corrections, and "records of blacks" [the volume's term, not mine] from 1765-1886. Hébert says that some records are mixed into the other volumes; check the entire series if you are researching African-Americans (most churches kept separate registers for slaves, which is probably why the records are separated in this volume). The "records of blacks" section has many records of slaves without surnames, which are alphabetized by first name only, followed by the slaveowner's name. Entries with surnames may refer to free people of color, slaves, or post-slavery records, depending on the date and the person's status. Other surnames on the page include LEDE (Amelia through Valentin), LEDET (Jean only), LEDOUX (Louis Palemon only), LEIGH (Mrs., slaveowner on Bayou Boeuf), LEJEUNE (Louis only), and LEMELLE (partial, Alphred through Félicité), in records from 1801-1876. I'm happy to do lookups; just drop me a line w/the given name/s or places for which you're looking at the address at the right side of my blog page under "about me." p.s. Some of my ancestors owned slaves, unfortunately. Fortunately, I don't mind if you see a familiar surname in my blog and want to ask me about it. I haven't researched all my ancestors' history with (or without) slavery, and I'm a bit new to that area of research, but ask me if you like, I'll look into it. It's weird, it's awkward, but we can be weird and awkward together, and maybe help each other along the way. I'm sharing the recently-acquired "official military personnel file" (OMPF) for my dad, a WWII U.S. Naval aviator in the Pacific, a few pages at a time. Click here to see what I've posted so far, and click on any image to enlarge it. After training as a U.S. Naval cadet in 1944 in Athens, Ga., St. Louis (where he trained in, among others, Boeing/Stearman biplanes like the one pictured below), and Pensacola, Fla., Dad was appointed as an Ensign in the U.S. Naval Reserve. 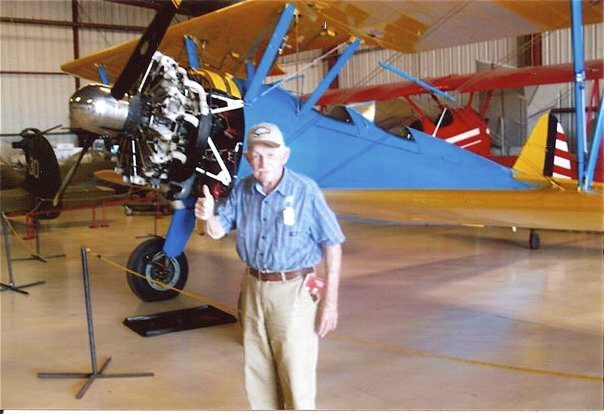 George Hall, Planes of Fame Air Museum, Chino, Calif., Oct. 2009. Photo by J. Morgan, privately held by Liz Hall Morgan. 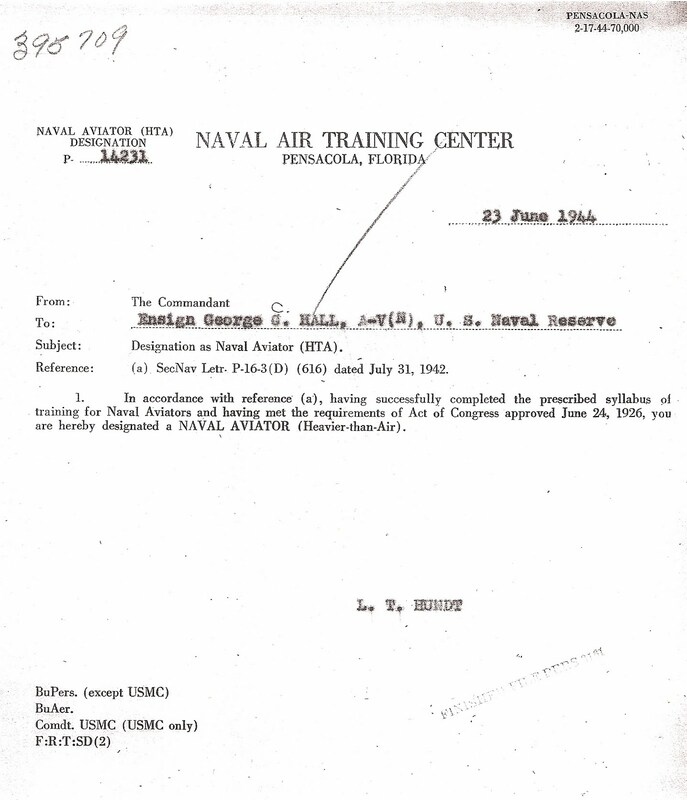 The memo above concerns appointment as an ensign and reporting to the commandant of the Naval Air Training Center in Pensacola, Fla., for further assignments. Dad's cohorts at the time included Arthur Dale Gripton, Robert Watrous Guernsey, Jerauld Anthony Gunzelman and Raymond Joseph Happley. 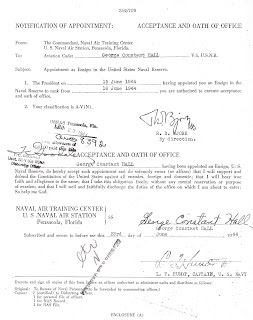 Above is the acceptance and oath of office, dated June 23, 1944. 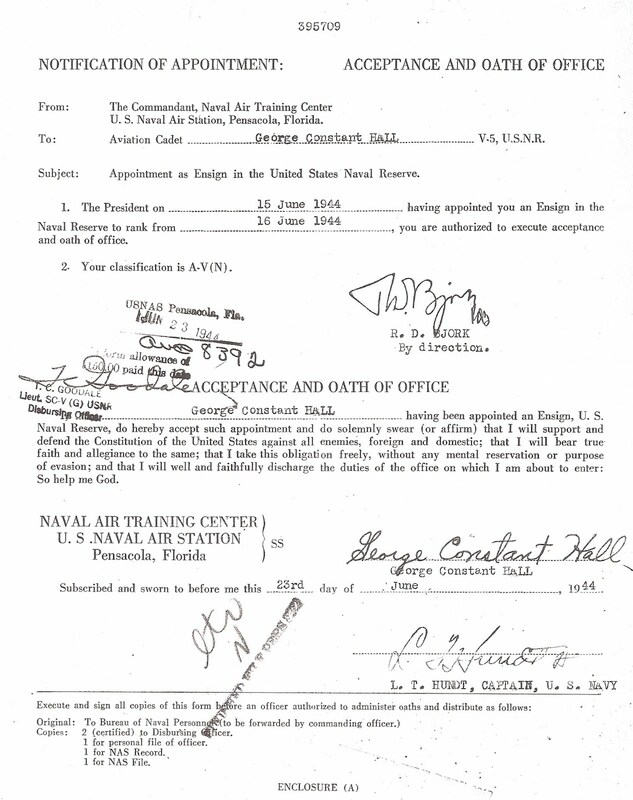 Dad's oath: "I, George Constant Hall, having been appointed an Ensign, U.S. Naval Reserve, do hereby accept such appointment and do solemnly swear (or affirm) that I will support and defend the Constitution of the United States against all enemies, foreign and domestic; that I will bear true faith and allegiance to the same; that I take this obligation freely, without any mental reservation or purpose of evasion; and that I will well and faithfully discharge the duties of the office on which I am about to enter: So help me God." 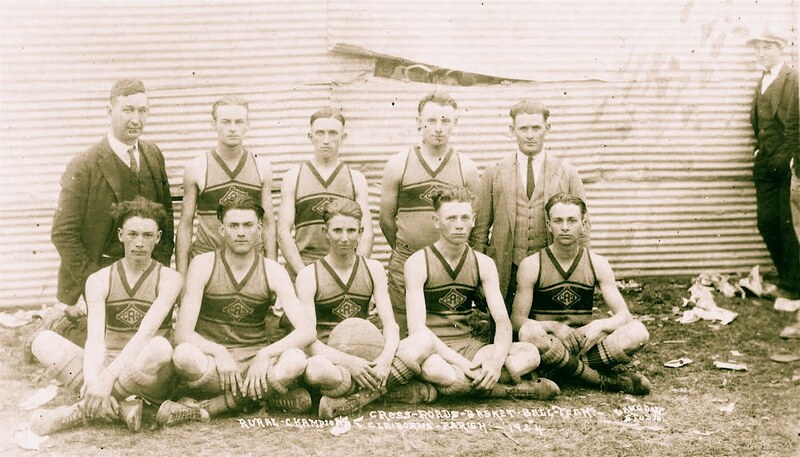 Cross Roads Basketball Team, Rural Champions, by Langdon Photo, Claiborne Parish, LA, 1924. 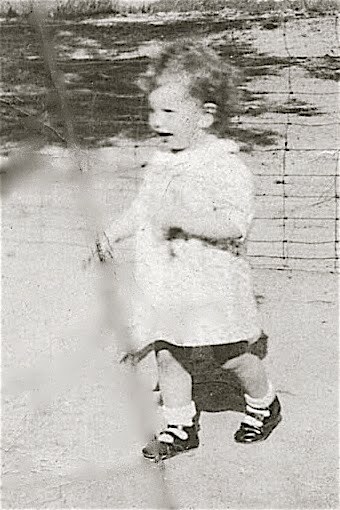 Photograph privately held by the Hall family, La., edited slightly. Front row, L-R: Irene Harmon (m. Justin Caskey), Bertha Harmon (m. Lamar Nicholson), Winnie Harmon (m. C. Hicks), Georgia Cardwell (m. Ike Gore), Vera Stevenson (m. Lenton P. "Pete" Frye). Back row, L-R: Edna Pate (m. Alvin Stevenson), Sula Cowser (m. Howard Barber), Katie Bell Craighead (m. Terry? Gamble), Myrtie White (m. Chelcy Blagg), Mrs. Dave Tarpley [née Willye Lee Kimbell], Principal. Cross Roads is a community about 3 miles east of Athens, Louisiana. 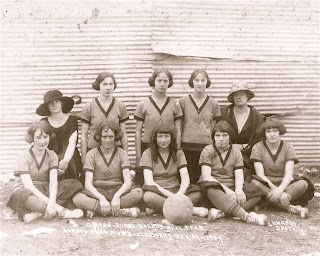 My grandmother Edna Maud Pate, teacher and team coach, is in the hat on the left. (She knew nothing about basketball but learned the rules when she was asked to coach the girls.) My great-aunt Vera Stevenson is sitting on the right in front. I don't know the identity of the others. Edna & Vera became sisters-in-law a couple of years later, when Edna married Vera's brother Alvin Jasper Stevenson. See the updated boys' team photo, which includes members of the Harmon, Cardwell & Cowser families, here. 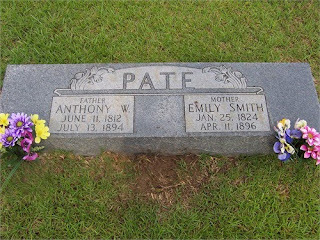 Anthony William Pate and Emily Lena Smith (possibly Lena Emily Smith) are my great-great-grandparents, the grandparents of my maternal grandmother Edna Maud Pate Stevenson. 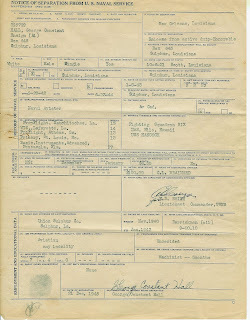 Anthony, a farmer, was born to Mr. & Mrs. Willeroy Pate (her maiden name is unknown) on 11 Jun. 1812 in Smith or Jackson County, Tenn. Emily was born to Mr. & Mrs. [Samuel?] Smith on 25 Jan. 1824 in Arkansas. The couple was married by 1841. They are found in census records in Claiborne Parish, La., in 1850 (and possibly 1840, though there is another Anthony Pate family who lived in Claiborne Parish) and had moved to Bienville Parish by or before 1880. Anthony died in Heflin, Webster, La., on 13 Jul. 1894. Emily died in Bienville Parish, La., on 11 Apr. 1896. Their children were: Leroy Pate, Mary Elizabeth Pate Harper, Serena Pate McFarland, Jasper Grady Pate, Margaret Josephine Pate Davis, Newton King Brady Pate (my great-grandfather), Anthony D. Pate, May R. Pate Hand, Martha G. Pate, Wilberoy S. Pate, and Jerome B. Pate. To see my entire Pate line and a photo of siblings Newt and Serena, click here. For more on my Pate line and other Pate families, see the late Jinks Pate Lee's website here. Questions: Where did they live between 1850 & 1880? [No, I don't think Anthony in the census in Arkansas is "our" Anthony.] Mr. Smith [Samuel?] and his wife were born in Maryland, according to Emily's 1880 census entry, and she was born in Arkansas. Anyone out there have a Samuel Smith or other Smith born (roughly) about 1800 in Maryland who lived in Arkansas? What was Willeroy Pate's wife's name? See "about me" on the right side of my blog for my e-mail address. Thanks! *Note: Bistineau Baptist Church & Bistineau Cemetery's address is Heflin, La. (in Webster Parish), but according to Find A Grave, the cemetery's physical location, near the parish line, is in Bienville Parish. Text copyright 2010 by Liz Hall Morgan, all rights reserved. He married Rebecca Jane Harrell and had two children, including my great-grandmother Maggie Elizabeth McCoy Stevenson. The family is listed in the 1880 census in Lincoln Parish, La. 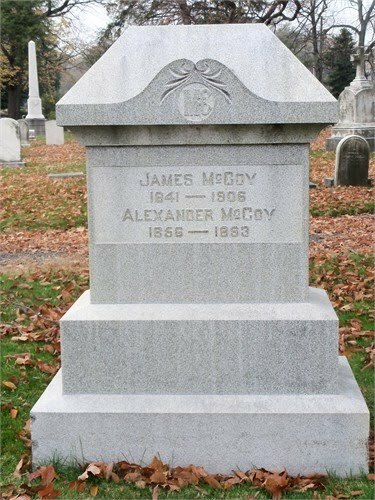 Some time after Jane's death in 1881, he either returned to Delaware to live or was simply visiting family when he died there on Jan. 26, 1906. If anyone has more info on where James lived during his life, his wife Rebecca Jane Harrell's burial place, or what happened to their son "N.," who disappears after the 1880 census (I'm guessing he died young), please e-mail me at hallroots (at) sbcglobal (dot) net. Thanks! Remembering those lost in Hurricane Katrina due to the madness of both natural and man-made disasters. Thinking of those who are still rebuilding their lives all along the Gulf Coast. For news coverage, see: nola.com, al.com, gulflive.com. St. Louis Cathedral, Jackson Square, New Orleans, Oct. 2009. Digital photo copyright 2010 by Liz Hall Morgan, all rights reserved. My dad, George Hall, and his brother John both attended LSU. Dad earned a bachelor's in biology, Uncle John in dairy science. Both attended on the G.I. bill, I think, after World War II. 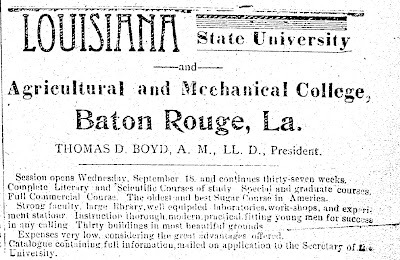 LSU opened its doors in 1860 as the Seminary of Learning of the State of Louisiana. Hmmm, that means its 150th birthday is this year. I can almost smell the grills firing up for some amazing tailgate celebrations this fall! 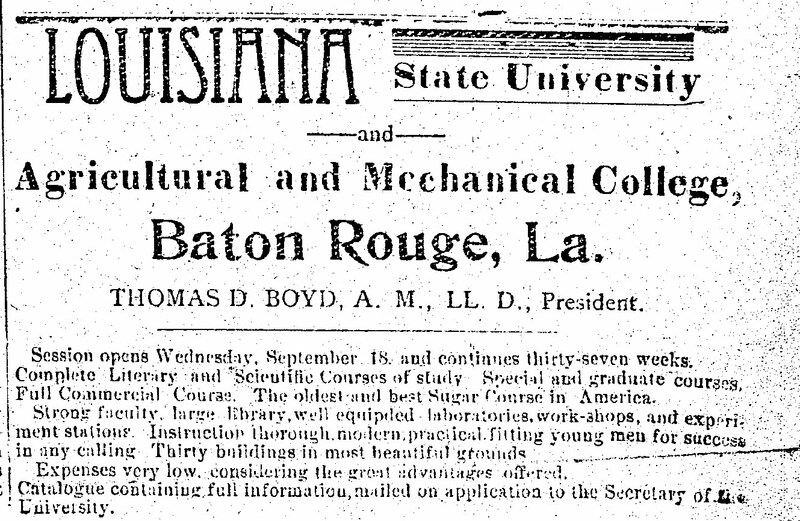 Click here for more on LSU history. Text copyright 2010 by Liz Hall Morgan; all rights reserved. 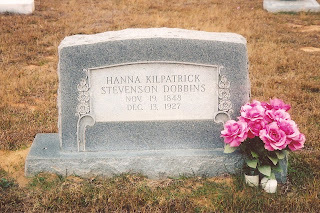 Hannah E. Kilpatrick Stevenson Dobbins headstone, Tulip Cemetery, near Athens, Claiborne Parish, La. Photo by M. Hall, abt. 2005. Hannah [the headstone spelling is wrong] was my great-great-grandmother. She married James W. Stevenson (my great-great-grandfather), and later married Giles Weaver Dobbins. She was born Nov. 19, 1848, in Franklin County, Tennessee, to John Milton Kilpatrick and Emily Coleman Morgan. Hannah died Dec. 13, 1927, in Marsalis, Claiborne, Louisiana. Sixty-five years ago Sunday was V-J Day, or "Victory over Japan Day," the day Japan announced its surrender in World War II, at least on the Japanese side of the international date line, where my dad, George Hall, was a U.S. Navy fighter pilot. It apparently was still Aug. 14, 1945 in the United States. (However, my trusty Associated Press Stylebook says that V-J Day is considered to be both Aug. 15, the day fighting ended, and Sept. 2, the day of official surrender.) In any case, I wanted to post a photo of a flyer printed by my dad's aircraft carrier, the USS Hancock, which he kept with his Navy memorabilia (click photo to enlarge it). "War Over!" flyer, USS Hancock, off Japan, August, 1945, privately held by the Hall family, La. Digital photo by Liz Hall Morgan, Feb. 2010. The flyer reproduces the text of the message from the Secretary of Navy which was "read to all hands at 0900, Tokyo time, 15 August by Captain Hickey," and President Truman's address to the American people. It also states that the chaplains later led the crew in a prayer of thanksgiving and also a prayer for those who gave their lives in the war. Dad said he was on patrol in the air in his F6F Hellcat at the time Japan's capitulation was announced, and he & his colleagues celebrated by doing a loop or two and chasing each other around the sky, though they were on alert for any Japanese planes looking to make a final attack. He thought a buddy in his air group (VF-6) shot down the last enemy plane of the war, though I don't know if that was ever proven. 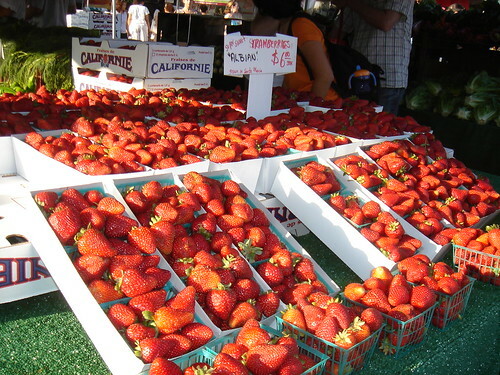 South Pasadena, Calif. Farmer's Market, 31 July 2008, from "Benjamin Page's Pasadena and Los Angeles by Benjamin Page," on Flickrphoto, used under Creative Commons license. Pluots, peaches, plums, oh my! Newton King Brady (or Bradie) Pate and Etta Orisca Cotter Pate are my great-grandparents, my maternal grandmother Edna Maud Pate's parents. They are buried in Pleasant Grove Cemetery in Ringgold, Bienville Parish, Louisiana. 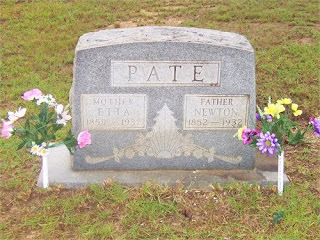 Headstone of Newton King Brady & Etta Orisca (Cotter) Pate, Pleasant Grove Cemetery, Ringgold, LA, Feb. 2005. Photo copyright by J. Marler, 2005, used with permission. Etta Orisca Cotter, 2 Sept 1886 in Bienville Parish, La. Etta was born to William Hadden Cotter & Queen Ann Elizabeth (a.k.a. Elizabeth Ann) (Farris) Cotter 19 Mar 1859 in Ringgold, Bienville, La. and died 27 June 1937 in Ringgold, Bienville, La. Newt and Etta's children were: Lucy Elizabeth Pate Corley, Minnie Lee Pate Wimberly, Emily "Lena" Pate Scott, James "Weaver" Pate, Zella Estella or Estelle Pate Young Giddens, Edna Maud Pate Stevenson, Ora Adell Pate Woodard, and Jasper "Brady" Pate (a.k.a. J.B.). For more on my Pates, including Bible records, portraits and stories, click here. For other Pate families in Louisiana and elsewhere, check out the late Jinks Pate Lee's website. Today we have my McCOY line, one of my few Northern lines, originating from my maternal great-grandmother. Corrections, additions, and questions welcomed; this is a work in progress. Numbers refer to ahnentafel (pedigree chart) numbering. Sources are available--just ask! See my blog ("about me" on the right sidebar) to contact me for more info or to share info. 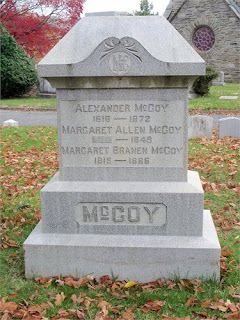 Immigrant ancestor Alexander McCoy's plot in Wilmington & Brandywine Cemetery, Wilmington, Delaware. Digital photo courtesy of J. Marler, Nov. 2009, all rights reserved. 12. John William STEVENSON. Born (to James W. Stevenson and Hannah E. Kilpatrick) on 9 Jul 1871 near Homer, Claiborne Parish, LA. John died in Caddo Parish, LA, on 29 Apr 1942. Buried in Athens, Claiborne, LA (Tulip Cemetery near Athens). Children: Ethel Gertrude Stevenson, Alvin Jasper Stevenson (Sr.), John T Stevenson and Vera Mae Stevenson Frye. 27. Rebecca “Jane” HARRELL. Born (to Levi Thomas Harrell ("Billy") and Rebecca A. Smith) abt 1854 in AL. 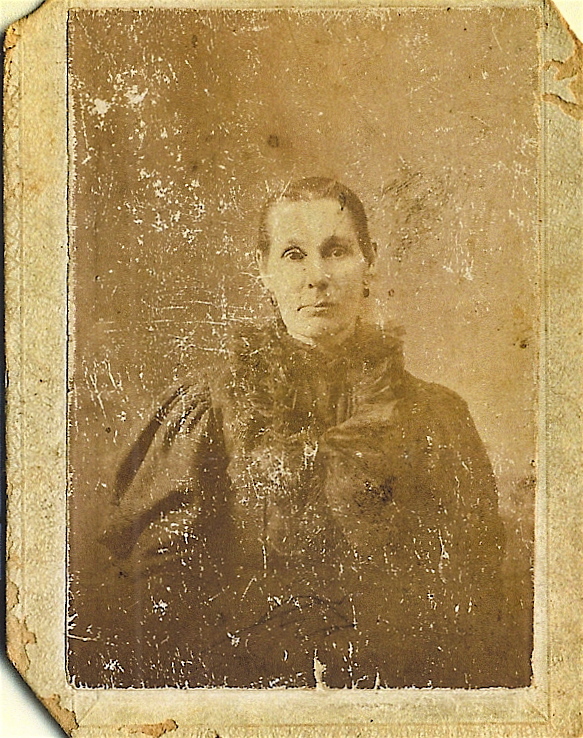 Rebecca Jane died in Lincoln or Union Parish, Louisiana, abt 1881. Children: (son) N. McCoy [died young?] and Maggie Elizabeth McCoy Stevenson. Note: We'd love to know more about Jane if anyone has more info. 53. Margaret ALLEN. Born in DE. Margaret died in 1849, prob. in Wilmington, DE. Buried in 1849 in Wilmington, New Castle, DE (Wilmington & Brandywine Cemetery). Children: Martha Jane McCoy Garey or Geary, Ann or Anna McCoy McCartney, Mary McCoy, William "Will" McCoy, and Emily McCoy Colwell. Note: "Follow Friday" is a theme used by some geneabloggers to recommend other bloggers, websites or genealogy resources of interest. Stanley LeBlanc's The Cajuns website has useful info and links for researching South Louisiana ancestors (especially Cajuns, but also others), including history, maps, place names and even a list of hurricanes to hit Louisiana. Stanley also offers various reports for nominal fees. Now was "b" for baptism, burial, or birth? (Oh my!) And what was that church's name in Duson? After I e-mailed him that I had mentioned his site's useful key to the abbreviations of Hebert's Southwest Louisiana Records (SWLR) volumes, he replied that he had been meaning to add more abbreviations lists and almost immediately added info for Hebert's South Louisiana Records (SLR) volumes. (Both are under the "Resources" drop-down menu.) How's that for service? Stanley has also added info for the Diocese of Baton Rouge Catholic Church Records volumes (DOBR) and the Sacramental Records of the Roman Catholic Church of the Archdiocese of New Orleans (ADNO) volumes (also under the "Resources" menu). Each of these multivolume sets do contain a key in each book. However, if you've used library volumes or Internet sources (trust but verify!) and aren't sure about a particular abbreviation later, or if you want to figure out what year a parish was organized to narrow down where an ancestor was baptized, for instance, Stanley's lists can be a big help. His "Corrections" link also points you to published corrections to some of these and other well-known compilations of Louisiana records. Don't neglect checking corrections and additions to these volumes, as you could find an elusive answer in this way. "The Cajuns" thus is a useful complement for your South Louisiana genealogy research, and fun to peruse, as well. Copyright 2010 by Liz Hall Morgan. All rights reserved. 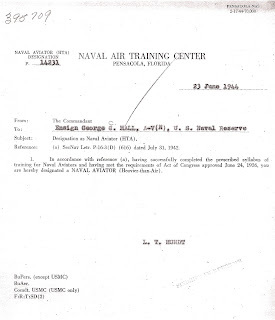 Last week, I posted Dad's Navy separation document, which listed some of his training to become a Navy pilot. Here are a couple of books he used during that training. Principles of Flying, manual used by George Hall and privately held by the Hall family, La. Digital photo by Liz Hall Morgan, Jan. 2010. CPT Pilot Rating Book used by George Hall in US Naval aviator training and privately held by the Hall family, La. Digital photos by Liz Hall Morgan, Jan. 2010. Dad then trained in Athens, Ga., St. Louis, and Pensacola, Fla. before becoming certified as a naval aviator and receiving a commission. (More on that to come.) Dad also recorded his memories on a DVD; once I learn more about DVD editing, I will perhaps post a snippet or two of digital video and let him tell you about his service in his own words. Text/images copyright 2010 by Liz Hall Morgan. All rights reserved. 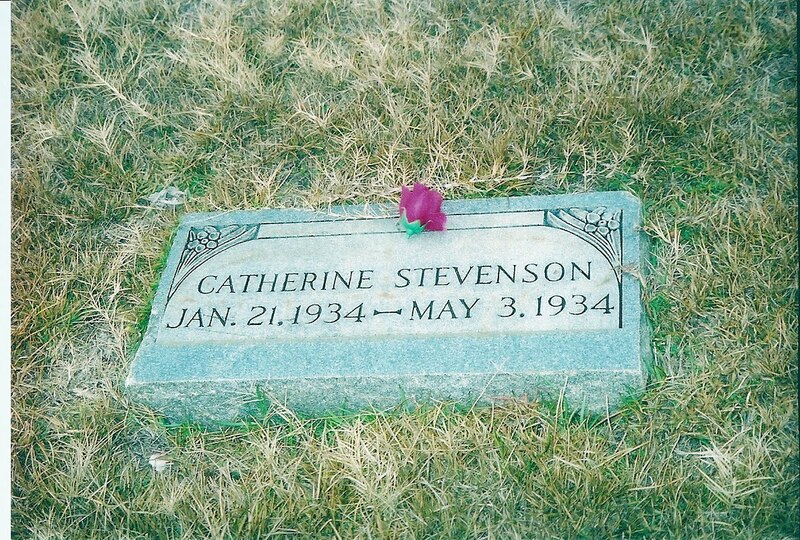 [Peggy] Catherine Stevenson, Jan. 21, 1934 - May 3, 1934, Tulip Cemetery, in Claiborne Parish near Athens, Louisiana. 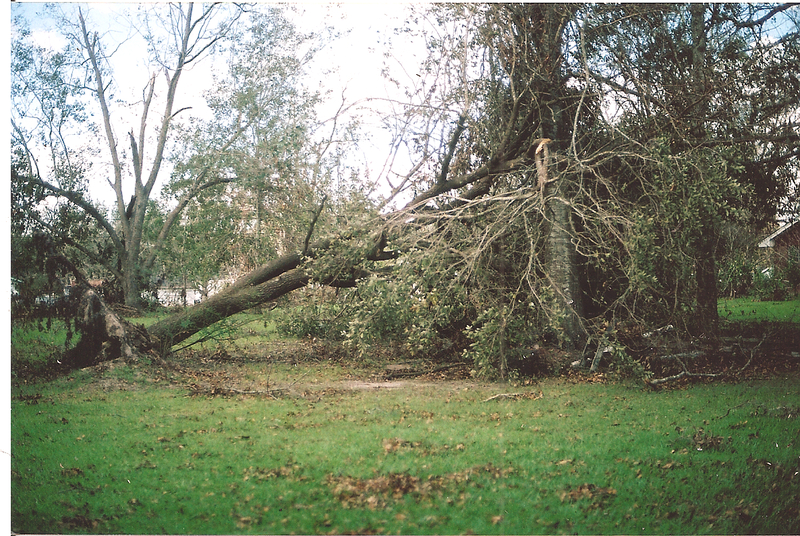 Photo by M. Hall c. 2007, privately held by Liz Hall Morgan. Peggy Catherine (there apparently wasn't room for her entire name on the stone or it was a mistake that was not corrected) was my mom's baby sister who died due to Rh disease. The third child of Alvin Jasper Stevenson, Sr., and Edna Maud Pate Stevenson, she is one of those children who live and die between censuses and are thus easily omitted from family histories. My mother and a cousin or two may be the only living people who remember her; no photos exist of which I'm aware. Mom says the arrival of her baby sister was like having her very own living baby doll. I think she probably would have had light reddish brown hair and fair skin like her siblings. Perhaps the closest I can come to imagining her appearance is by looking at one of the earliest photos of my mom, below (cropped and edited rather clumsily, but it will suffice). RIP, Aunt Peggy. You are still remembered with love. 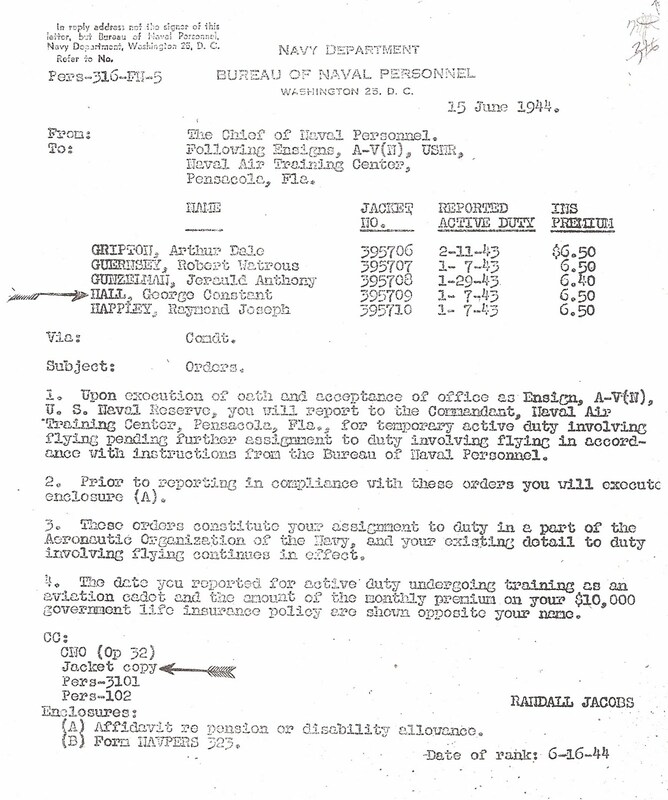 Although a copy of my dad's military separation document is one of the last items in his OMPF (Official Military Personnel File), I'm posting the scanned original as part four of this series. 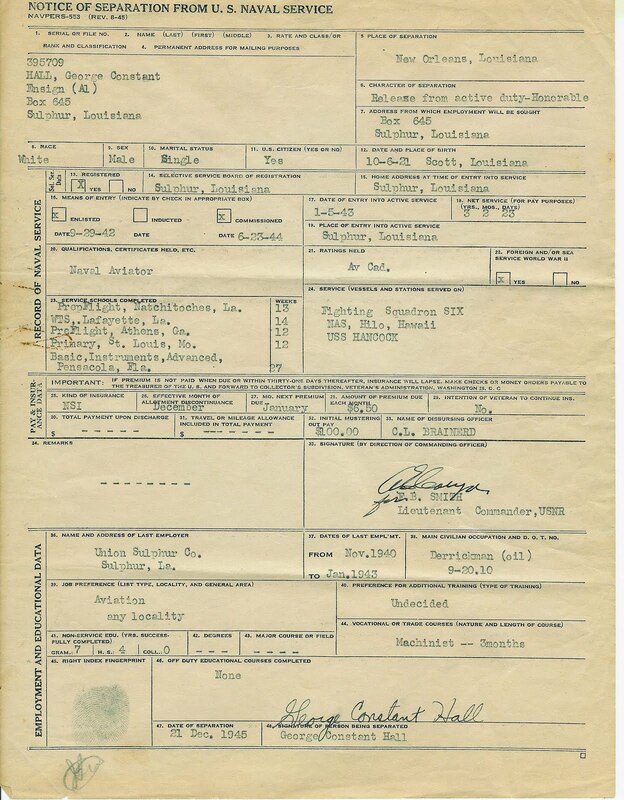 Curiously, the file doesn't contain documents detailing his training as an aviator cadet, but this form lists the types of instruction he received with the location and duration of each, along with a wealth of other info. 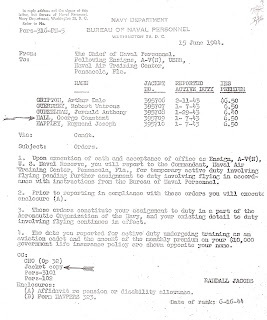 (Have you neglected military records in your own 20th-century research? You might be surprised at how much info they contain.) It seemed a logical next post as I discuss Dad's military career chronologically. Notice of Separation from U.S. Naval Service (Form NAVPERS 553) for George Constant Hall, 21 Dec. 1945, New Orleans, Louisiana. Digital scan of original privately held by the Hall family, La. "Basic," "Instruments," and "Advanced," Pensacola, Fla., 27 weeks. The form states that he served in Fighting Squadron Six (also known as VF-6). Dad was a fighter pilot, and the form tells us that he served aboard the USS Hancock, an aircraft carrier stationed out of NAS Hilo, Hawaii. Also given are dates and details of his previous employment, as a "derrickman (oil)" for the Union Sulphur Co. in Sulphur, La., and his preference (at the time) to work in aviation after leaving the Navy. The form also lists his formal education (high school) and vocational training (3 months of machinist instruction) as of December, 1945. Oh, and it tells me that Dad's draft board was in Sulphur, La., where the Hall family had lived since the 1930s. For World War II draft records, only the Fourth Registration ("the old man's draft") is currently open to the public due to privacy laws. I can wait for Dad's registration record--I don't expect to find any info I don't already know--but this is a great clue for my "mystery grandpa" Robert Bunyan Hall, who may have qualified for that registration (men who born on or between 28 April 1877 and 16 February 1897 who were not already in the military -- Grandpa's birth year is listed as 1875, 1877 and 1878 on various forms). Currently, Ancestry.com does not have the Louisiana records (some records are online there), but they are available on microfilm. Woo hoo! While today's military separation forms (detailing release or discharge from active duty) are referred to as "DD Form 214" or "DD-214," the forms had other designations in the past. The National Archives website states: "Before January 1, 1950, several similar forms were used by the military services, including the WD AGO 53, WD AGO 55, WD AGO 53-55, NAVPERS 553, NAVMC 78PD, and the NAVCG 553." Find out more about requesting military personnel files here. Tsunami evacuation route sign, Hermosa Beach, California, 25 July 2010. 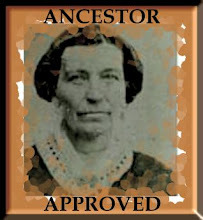 Today we have my McBRIDE line, originating from my paternal great-grandmother. Corrections, additions, and questions welcomed; this is a work in progress. Numbers refer to ahnentafel (pedigree chart) numbering. Sources below; see my blog ("about me" on the right sidebar) to contact me for more info or to share info. 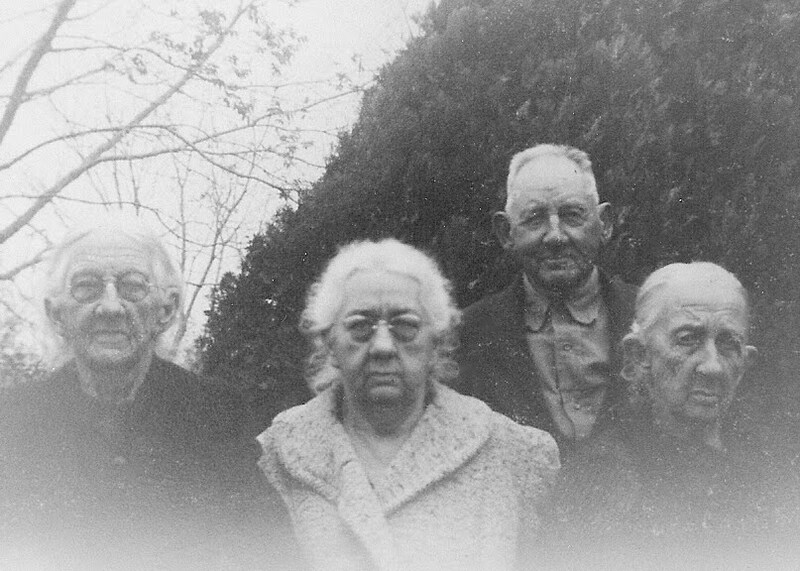 L to R: Siblings Marie McBride Dupre, Clothilde McBride Devillier, Joseph "Joe" McBride and Octavie "Tavie" McBride Legere on the day of brother Felix McBride's funeral, 10 Dec. 1941, Port Arthur, TX. Photographer unknown; copy of original privately held by Hall family of La. and edited by Liz Hall Morgan. 22. William McBRIDE. Born abt 1822 in St. Landry Parish, LA. ,  William died on 3 Jan 13 Jan. 1875 in Port Barre, St. Landry, LA? [Everyone & his dog has this date; what is the source? v. 12 of SWLR? Please e-mail me if you know.] Possibly served in the Confederacy in the Civil War. UPDATE: Southwest Louisiana Records by Hebert, v. 12, p. 345 has: "McBRYE [sic], William d. 13 Jan 1875 at age 45 yrs [sic]. (PB Ch: v. 1, p. 95)." This is Sacred Heart Catholic Church, Port Barre, LA. The Confederate soldier is another William McBride. 44. Thomas Walter McBRIDE. ,  Born in Virginia. Thomas Walter died on 12 Oct 1824 in New Orleans, Orleans, LA. , ,  He was a blacksmith. UPDATE: Probate records are now available at familysearch.org in the collection "Louisiana, Orleans Parish Estate Files (under "Walter McBride"). He lived on Tchoupitoulas Street in New Orleans. Five enslaved persons are named in the probate: Adam, Babe [spelling? ], James, Mary and Mary's daughter Maria. After Thomas Walter's death, Julienne married Joseph W. TINSLEY and then Jean Frederick GABEREL. POSSIBLY, but it has not been proven, they married 28 Nov 1769 in Joppa, Baltimore, MD , . More research needs to be done; this record, from an index, may be available on microfilm. 1. Rev. Donald J. Hebert, Southwest Louisiana Records, 41 volumes, Rayne, LA: Hebert Publications, 1974-1998, v. 6, p. 451, citing Opel. Ch. [St. Landry Catholic Church, Opelousas, LA], v. 6, p. 103: "McBRIDE, Marie Octavie (William & Melasie HOLLIER) b. 31 Jan 1859." 2. 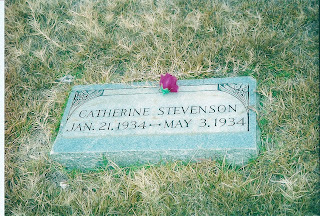 Octavie McBride Legere tombstone, St. Peter Catholic Church cemetery, Carencro, LA, photographed by M. Hall, 1995, "Mrs. Constant Legere, 1859-1946." 3. Ancestry.com, "Louisiana Statewide Death Index, 1900-1949 [database on-line]." Provo, UT, USA: The Generations Network, Inc., 2002, Lafayette Parish, LA, vol. 5, certificate #839. 4. FamilySearch, "Louisiana Deaths, 1850-75; 1894-1954." http://pilot.familysearch.org/recordsearch/start.h-tml#c=1609793;p=collectionDetails;t=searchable. 5. 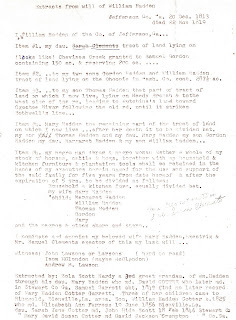 "Transcript of Baptismal Record of Constant Legere," St. Landry Catholic Church, 17 Nov. 1961, Opelousas, LA, Baptism Book VII, p. 64, #47, photocopy of official transcript recorded by Rev. Alcide Sonnier, owned by Liz Hall Morgan. 5a. FamilySearch, “Louisiana Deaths, 1850-75; 1894-1954.,” http://pilot.familysearch.org/recordsearch/start.h-tml#c=1609793;p=collectionDetails;t=searchable. 5b. “Constant Legere tombstone (shared with daughter Odette),” St. Peter Catholic Church cemetery, Carencro, LA, photographed by M. Hall, 1995. 6. Research of K. LeDoux and M. Hall. 7. Rev. Donald J. Hebert, Southwest Louisiana Records, 41 volumes, Rayne, LA: Hebert Publications, 1974-1998, v. 20, p. 250, citing Carencro Ch. [St. Peter Catholic Church, Carencro, LA], v. 2, p. 74, 23 Feb 1889. 8. Ibid. v. 20, p. 250, citing Laf. Ct. Hse. [Lafayette Parish Courthouse, Lafayette, LA], mar. #4319, 20 Feb. 1889. 9. Ibid. v. 5, p. 421, citing Opel. Ch. [St. Landry Catholic Church records], v. A, #17, marriage of Wm. 10. "1860 U.S. Census," Opelousas, St. Landry, LA, p. 187, lines 14-20, 26 Sept 1860, digital image of Nat'l Archives microfilm, www.ancestry.com, b. abt 1825, LA. 12. Rev. Donald J. Hebert, Southwest Louisiana Records, 41 volumes, Rayne, LA: Hebert Publications, 1974-1998, v. 5, p. 421, citing Opel. Ch. [St. Landry Catholic Church, Opelousas, LA], v. A, #17: "McBRIDE, William (Walter & Julie BAUGARD [sic]) m. 20 Jan. 1852 Melasie HOLLIER." 13. Ibid. v. 5, p. 421, citing Opel. Ct. Hse. [St. Landry Parish Courthouse, Opelousas, LA], mar. #931: "MCBRIDE, William m. 22 Jan. 1852 Melasie HOLLIER" [civil ceremony following church?]. 14. Ibid. from CD, via Denise Talbot's Rootsweb tree: "HOLLIER, Melasie (Isidore & Artemise TRAHAN) b. 11 Dec. 1830, Pats: Isidor HOLLIER & Sophie LANGLOIS; Mats: Pierre TRAHAN & Elene DUPLECHAIN (Opel. Ch. : v.3, p.149)." 15. Headstone of Melasie Hollier McBride, Sts. Peter & Paul Catholic Church Cemetery, Scott, LA, digital photograph by Liz Hall Morgan, Feb. 2009, "McBRIDE/Mrs. Wm. McBride/née/Melasie Hollier/Dec. 11, 1825 [sic - should be 1830]/Aug. 19, 1925/In loving memory/by grandchildren." 16. Rev. Donald J. Hebert, Southwest Louisiana Records, 41 volumes, Rayne, LA: Hebert Publications, 1974-1998, v. 1, p. 423, citing SM Ch. [St. Martin of Tours Catholic Church, St. Martinville, LA], [n.v., n.p. ]: "McBRIDE, Thomas Walter (Thomas & Marie SCOTT) m. Julienne BONGER [sic]." 17. Ibid. v. 5, p. 421, citing St. Landry Catholic Church records, v. A, #17 (m. rec. of son Wm.). 18. "1880 U.S. Census," St. Landry Parish, LA, daughter Mary "Feuta" [sic] Futhy‚ father's place of birth = VA.
19. Rev. Donald J. Hebert, Southwest Louisiana Records, 41 volumes, Rayne, LA: Hebert Publications, 1974-1998, from CD via David Leleux's Rootsweb tree: (d. bef 1 Feb. 1834) "McBRIDE, Guillaume [William] (dec. Walter McBRAID & Pouponne BAUGARD) bt. 1 Feb. 1834 at age about 12 yrs. Spons: Christophe STEEL & Anastasie LEGER, wife of Christophe STEEL. Fr. Flavius Henri ROSSI (Opel. Ch. : v.3, p.267)"
20. "Southwest Louisiana Records CD 101," Rev. Donald J. Hebert, Hebert Publications (now pub. by Claitor's Publishing, Baton Rouge, LA), via Denise Talbot's Rootsweb tree: "McBRIDE, Walter m. Julienne BOGARD died in New Orleans Children: Thomas; Mary; David; Walter; Charles; William; Anna; Malelda [sic-Mathilda]. Succ. dated Feb. 1825 (Opel. Ct.Hse. : Succ.#349)." 21. Louisiana Gazette, New Orleans, Orleans, LA?, 14 Oct 1824, p. 2, col. 2, via G. Bonnet's Rootsweb tree, died of gangrene. 22. Rev. Donald J. Hebert, Southwest Louisiana Records, 41 volumes, Rayne, LA: Hebert Publications, 1974-1998, v. 5, p. 421, citing St. Landry Catholic Church records, v. A, #17 (m. rec. of son Wm.) -- "Julie BAUGARD." 23. Ibid. v. 1, p. 56, citing SM. Ch. [St. Martin of Tours Catholic Church, St. Martinville, LA], n.v. (prob. vol. 1), "BONGER, Julienne (Jacob & Peggy RIDER) m. Thomas Walter [MCBRIDE]." 24. Ibid. v. 1, p. 54, citing Opel. Ch. [St. Landry Catholic Church, Opelousas, LA], v. 1, p. 120: "BOGUEN [sic], Julie (Jacques & Marguerite RAITER), b. 25 Aug. 1793." 27. Rev. Donald J. Hebert, Southwest Louisiana Records, 41 volumes, Rayne, LA: Hebert Publications, 1974-1998, v. 1, p. 423, citing SM Ch. [St. Martin of Tours Catholic Church, St. Martinville, LA], [n.v., n.p. ]: "McBRIDE, Thomas m. Marie SCOTT." 28. Ancestry.com, "Maryland Marriages, 1655-1850," www.ancestry.com, Aug. 2009, Name: Thomas McBride-Spouse: Mary Scotty-Marriage: 28 Nov 1769 [St. John's Parish (Joppa)?? - see database notes], Baltimore County, Maryland. Original record may be on microfilm; I need to check. Text copyright 2010 by Liz Hall Morgan. All rights reserved.